I have to say I'm not a fan at all of the roundness of this font. And as manx mentions, It's either OpenMPT or Open ModPlug Tracker - nothing inbetween. Cool I will rethink the overall look with more experimentation for the 'whole' name... the font, I specifically made the way it is - ie I took a font I liked and changed some of the letters (m and n specifically) and then rounded them off in a way I decided would suit a more modern look for modplug. I based the design off the one done by Úlfur Kolka, but without the bog standard and overused font, and with some other design elements. The black square icon is maybe a bit too nervous due to the vertical wires. At least for smaller sizes, they would probably need to be removed or simplified. Certainly, that is the reason for simplified logos, in all cases. for example the smaller the instance the simpler the logo will have to go. So for smaller uses of the logo we would use a simplified version such as the one on top. The wide logo appears to be putting emphasis on the "Open" part of the name, which is the least actually meaningful part of the name, imho. 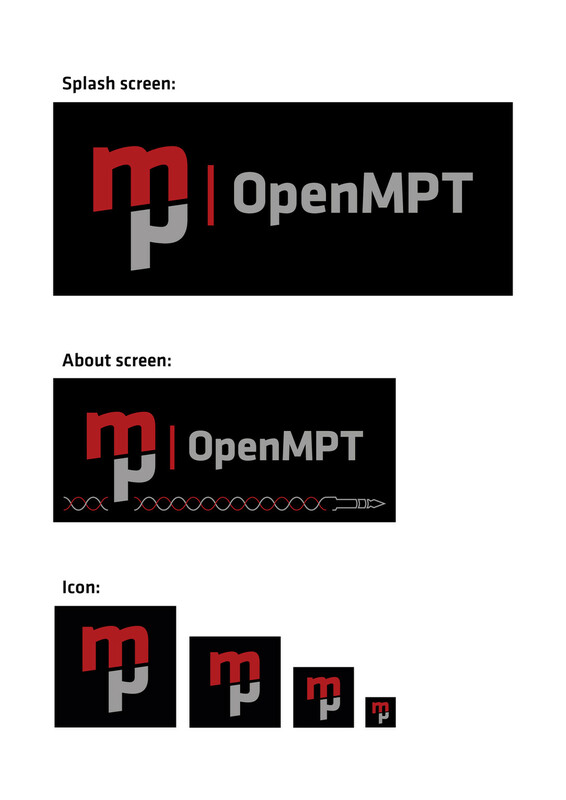 Also, it completely leaves out the "Tracker" part of the name, which kind of contrasts with the shortened name "OpenMPT" that we have been using for quite some time now for the most part. Interesting perspective - when I was inspired by the prev work, I was infact inspired by the bold emphases on the word 'open' which was I thought a well thought out choice... I will play with other tweaks and emphases sometime, concentrating on variations more focussed towards the full OMPT name. because the background of the logo does not easily integrate into page layouts due to varying background color. That can be quickly changed, I did this in macromedia freehand so it is all vectors. Ok here are some variations on that design in the simplified form concentrating on the whole name. As you can see adding more words makes the whole thing become more complex. Simple designs tend to pop out more. I love the one at the top, thinking of taking that direction a bit more next time. I like the "mod" above "plug" aspect as in most of these variations. In particular omptvariations.jpg last column second from bottom one with the "tracker" below it. The "Open" text in that one looks a bit off though. Also, could you try introduing some spacing in between "od" and "lug" It currently looks somewhat crammed together. While I'm happy that I inspired you, the logo is already finished (apart from a little bit of kerning). I'm working on the icon and the start up screen and expect all of the graphics to be finished in the next few days. The plug will be incorporated into the logo on the start up screen. My bad on the delay. Cool man, use or dont use, just know if you would like I can give you vectors in various formats, (translated perfectly into adobe illustrator too so ask if you are looking). Here are some more things I did, 1 a background for my pc, and the other was done considering the changes requested. The logo should definitely be red. I don't like the green one at all, and the orange one seems a bit off to me. Here's what I was thinking. I only like the sine wave and plug idea for the about screen. Personally I would skip them all together but I see this as a compromise to hold on to the plug. The sine wave and plug could also be used on their own, on the website or whatever. As discussed in our mails, I agree the sine wave in the about screen doesn't really work. From my perspective this is because it's way too regular and simple - which audio waveforms really are not. For it to work, it would have to be a much more "wavy" pattern like in my original inspiration, or maybe a regular waveform (e.g. of a drumline). It could also be possible to put such a waveform in the background behind the logo. As mentioned I want to keep the little water ripple effect working in the about screen, but that doesn't work if the graphics consist of mostly solid colours. From these icon's, I do like exhales versions most, except that they appear a bit blurry. A sharper version (more contrast?) of those would be my choice. I like the dark one more than the light one, but I would probably use the light one for documents. As I already mentioned, I'm not a fan of the typeface in Exhale's version at all. Apart from that, the gradients and colors are mostly okay (but also too dark for small icons as with ellobo's version).